I don't remember that being mentioned on the documentary, either, HB. The documentary did its best to portray Mrs Prout sympathetically - without success. Oddly, one of the reasons I feel her husband may be innocent is that he would almost certainly have received a light sentence if he had pled guilty to manslaughter - her conduct would have provoked a saint. Given her behaviour when she'd been drinking, I felt it was entirely possible she had thrown herself in a river or something in a fit of attention-seeking hysterics, which had gone wrong. honestbroker wrote: Northern Ireland, maybe, but wouldn't you need a passport to get to the republic? So, this criminal mastermind somehow disposes of his wife's body so cunningly that not a trace can be found - yet leaves her cards, phone, etc, lying around the house? I would need to see the documentary again to be sure, but I seem to recall the wife had been making mad, drunken phone calls alledging all sorts of things which demonstrably had no basis in reality, so I would not take it for granted that the diary is entirely truthful. Short of finding a body, we may never know what happened, but I personally would not rule out her having met her end accidentally whilst intoxicated; it does happen, especially in rural areas. I honestly do not know, HB. I saw the documentary, and was surprised at the verdict, and I have read a little in the press about it. I hadn't seen the blog before today, even. It was a dramatised edition of Murder in Suburbia, broadcasted on 6 March 2011....maybe it is on YouTube?? I can't find it. UK must have a Missing Broadcast website...?? I dunno. - His demenour was not right, demeour and attitude, Adrian remained consistent throughout. - He left it 5 days to report her missing, he only did so after he was persuaded by a concerned relative. - Discussion the day before Kate went missing, she put to him her increased demand for settlement. - The fact that he was going to lose their farm was central to the whole thing. Ah yes, that's what I saw - it was, I recall, an hour long? As it now appears he was NOT going to lose the farm, well, that makes the case against him even flimsier, doesn't it? They don't seem to have watched the same show as I did, Chicane. When I watched it, I kept thinking, Yes, but where is the actual evidence? It certainly didn't seem to me like a sound conviction. It amazes me how Gonc knew so much about these dogs reactions, as he was NEVER present at any one of the searches. How can he say what happened here. So how come his book makes out he was at these searches. More interstingly, where was he? He never met the McCann's or spoke to them. Something awful has just dawned on me, about the Prout case, which also involved the wonderdogs. Eddie and Keela, the two sniffer British dogs used to find evidences of Madeleine's death, in Portugal were used by the police in the searches of Kate Prout. Police now believe missing farmer Kate Prout was murdered. Officers have refused to rule out the possibility the 55-year-old from Redmarley may have come to harm. They say the possibility she has been murdered is stronger than ever. Although investigations at her Redhill Farm home finished a fortnight ago it is understood specialist sniffer dogs used in the search for missing four-year-old Madeleine McCann in Portugal have been used in the investigation and found evidence of Mrs Prout's death. Det Supt Neil Kelly said specialist dogs had been used but could not comment on what was found. As usual, nothing was found, but Prout is behind bars because Eddie woofed. 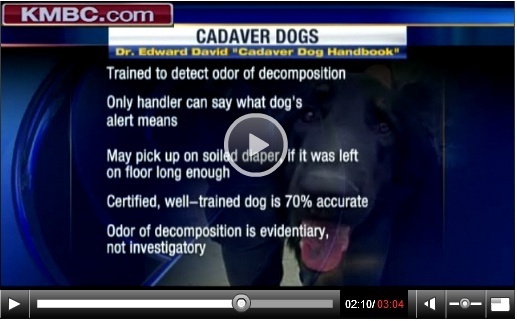 Interesting News Report on Video about Cadaver Dogs. I suspect Dr David knows rather more about it than people who keep shouting, Dogs Don't Lie! Dr Edward David wrote The Cadaver Dog Handbook. So I think he knows quite a lot. Count the dogs and the handlers. The story is enlightening too. The main discussion points are around Portugal and Jersey and the employment of a private company earning reputedly 1k a day plus expenses…l think l would blow my own trumpet if l could rake in that sort of money. These two particular dogs were owned and worked by ex Police Officer Martin Grime, were not licensed in any way, and on the many occasions he was offered to attend a Regional School anywhere in the country to be assessed he declined. I know of many more stories regarding this individual and his ‘trail of death’ dogs and he is not a favourite of mine, he has set us back in the forensic expert world due to the two main stories. I think we all suspected that, didn't we? You only had to watch Martin Grime to get some idea of what was going on.